Spray a 7x10-inch baking dish with nonstick cooking spray. Place a single layer of chocolate graham crackers across the bottom of the dish. In a stand mixer, whip together cream cheese frosting, whipped topping, coffee powder, cinnamon and cayenne until fluffy. Spread 1/3 of this mixture on top of the graham crackers. Sprinkle with 1/4 cup of the toffee bits. Layer graham crackers, whipped cream mixture, and toffee bits 3 times more. Cover and refrigerate overnight or for a minimum of 12 hours. To serve, drizzle slices of the cake with chocolate syrup. Garnish with the chili chocolate. Serve and enjoy! A more addicting dessert would be hard to find! Any cake that requires no baking is a friend of mine. So when the idea for this frozen cake was conjured, I knew I was already in love. But WHOA NELLY. I had no idea that I’d fall head-over-crushing-heels for the most tastydelicious no-bake cake concoction ever created. 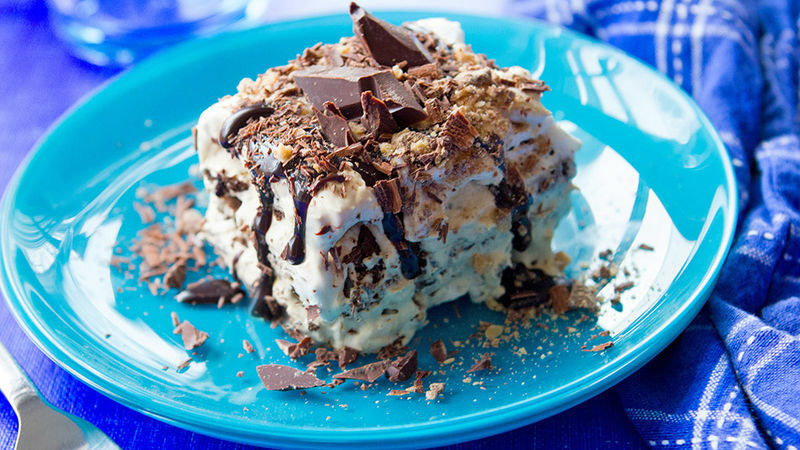 If you’ve ever had a chocolate eclair icebox cake, you are going to luh-urve this spiced up Mexican chocolate version even more. It’s like taking a spa vacay in Cacun! It all starts here. With four simple little chocolate graham crackers. You’ll then whisk up a batch of this spiced cream-cheese whipped cream. It’s full of cinnamon, coffee, cayenne, and arriba arriba. OMG. I dare you to not lick the bowl clean singlehandedly. And because chocolate, cayenne, cinnamon, and coffee aren’t perfection enough, let’s top it off with some dulce de leche-inspired toffee bits. Layer after layer of heaven – help me! Layer her up... then sprinkle with toffee and toss it in the fridge overnight. The cream layer soaks into the graham cracker layer, turning it into tender layers of cakey goodness. Brooke blogs at Cheeky Kitchen, where she shares crazy simple, healthy family recipes. She joined Tablespoon to share some of her best, so keep an eye on Brooke's Tablespoon profile to see what she cooks up next!